Digital Sagebrush: "Stop Right There!" Maya Angelou once said. “People will forget what you said. People will forget what you did. But people will never forget how you made them feel.” You made me feel bad, Belle. And you made a lot of other people feel bad, too. The poor guy in Row 4. Remember him? You yelled at him from halfway down the plane to stop, and put his bag in the first class overhead you were holding for the bulkhead passengers. The idea was good - you saved room for people who have no "under the seat in front of you" - but your tone of voice turned heads, and the shock on his face looked like he thought he was being arrested. Then that girl in 5A had the audacity, the AUDACITY, of trying to hang her jacket on the first class coat rack? You dressed her down good, Belle, just like she deserved. And in front of the entire plane, too, so we could all learn from her mistake. Serves her right. How dare she? Right, Belle? As you rightly, and loudly, pointed out - those hangers are for FIRST CLASS PASSENGERS ONLY. Bet she won't make that mistake again, will she Belle? And boy, you hate those sound-reducing headphones, don't ya, Belle. So annoying. Made that clear by waving a napkin right in that guy in 9C's face to get his attention. How dare he slow down your drink service? Hey pal, you wanna frigging soda or not? Stop wasting everyone's time. What a jerk. Right, Belle? I could go on - your snapping at people for not turning off their electronics fast enough, your reaching in and pressing seat-back buttons to "bring them to their fully upright position" for all those idiots who didn't respond fast enough. The little flick you used to grab empty cups from people's hands. Every little bit of your interaction with us made your passengers, the guests on your airplane, feel like interlopers - intrusions on your day, interruptions from your magazine reading time, pains in your carbuncles. Belle, you made us feel unwelcome. Today, relationships matter more than ever before in business. Digital amplifies our ability to express our likes and dislikes to worldwide audiences. A company's Digital Presence is fluid, and out of the control of the organization. The collective WE now owns it. Some companies get this. When I tweeted last week, "JetBlue isn't showing me the love today." I received an immediate response, "Uh oh, Kirby, what's wrong. Talk to us." When I tweeted about Belle, twice, USair refused to even acknowledge me (and I am a Platinum). What JetBlue realizes, and USair doesn't, is that relationships matter - especially in the digital world - and that every touch point with a customer is multiplied by every other one. Multiplying a hundred great experiences by one single ZERO experience negates the value of the entire relationship. USair, you better get your social media act together. You should have publicly acknowledged my tweet, and engaged me publicly in addressing the concern. You can't hide. You can't ignore customers. You can't be silent. Silent screams. It screams, "we don't care! you're wrong to tweet about us! 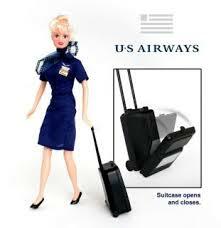 our flight attendants are sacrosanct! you will do as we tell you!" As for you, Belle, you just negated USair's relationship with 138 customers. Thousands more are going to read my tweets, and this post, and many of those will retweet or repost it. If you do really hate USair, USair passengers, your life, and the world in general, you're doing great and keep it up. Otherwise, maybe YOU need to, "Stop Right There!" And, you ought to read my other semi-famous blog about the very best flight attendant in the business, SkyAngel, over at American for some tips on how to do it right.